The product of three years spent busking on the streets of Europe – including every country in the European Union – and beyond, David Fisher’s Busking Beyond Borders adroitly captures the beauty, magic and unpredictable thrill of life on the road. In March 2015, the Birmingham-based musician (if the word ‘based’ makes sense for someone of such peripatetic bent) dropped everything and left the UK with little more than a guitar and a bag of clothes. Fisher tells the story of this time in a collection of ten Celtic-tinged folk songs. It’s an opening song that, thematically speaking, is something of an outlier in an album that can perhaps be condensed into three mostly sequential themes: The existential preference to travel free from the shackles of 9-5 conformity; the conflict between romantic fulfilment and pursuing the nomadic path; and Fisher’s evoking of his experiences in specific places. The pensive, fingerpicked ‘The Lofoten Islands’ – named after a picturesque island group off the west coast of Norway – adopts a different view on this tension between travel and romance as Fisher describes the untarnished perfection of a one day tryst (“Though we knew we’d never see each other again, we knew that it was perfect”). 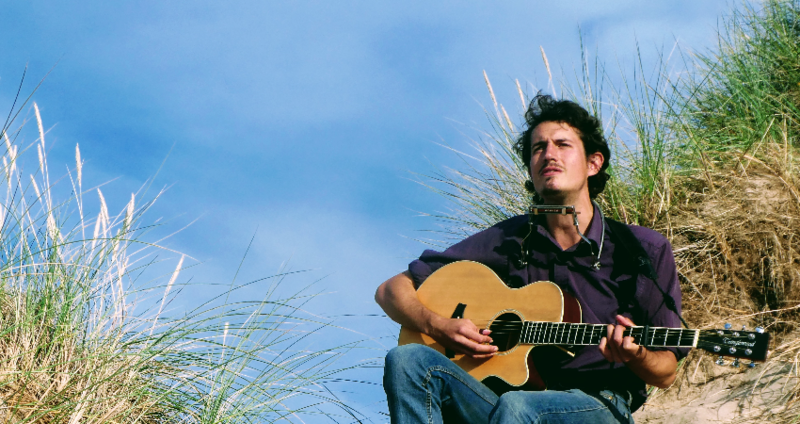 Based mainly around the twin accompaniments of guitar and harmonica – with the addition of banjo, mandolin, a backing singer to bolster Fisher’s ability to grasp a traditional folk vocal styling – Busking Beyond Borders has a simple and evocative troubadour feel. The premise of the album is inspiring enough but here Fisher proves that he has the song-writing chops to not merely rely on the enticing backstory from which it blossomed. Busking Beyond Borders is released on 10th December 2018. For more information visit here. Tagged album review, busking without borders, david fisher, scott hammond. Bookmark the permalink.